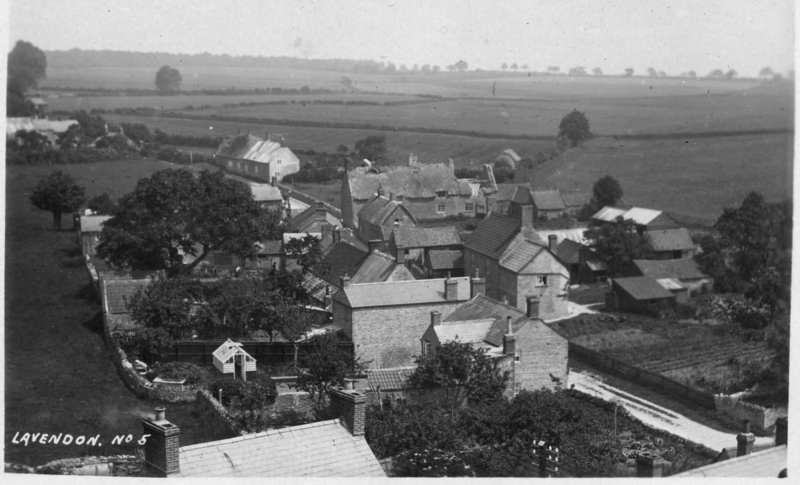 This vintage view of Castle Road was taken from the Church Tower circa 1920. The modern day view below was taken some 86 years later in July 2006. There are some obvious modern additions, notably the houses at the upper end of Castle Road, Joiners Way and part of the new Glebe, but what is especially striking is the extent to which the garden trees and field hedge lines have grown up making the area generally much “greener”. A number of houses and outbuildings have disappeared from the earlier view, especially those in and around the entrance to Joiners Way. Brian White recalls a conversation with Frank Lay in years gone by, when he was told that the greenhouse that features in the earlier picture (in the grounds of the Old School House) was built in about 1920 and that only a few years later the garden of the latter house was extended into the Bury Field (to the left) belonging to Frank Kitchener, as is evident in the modern view. 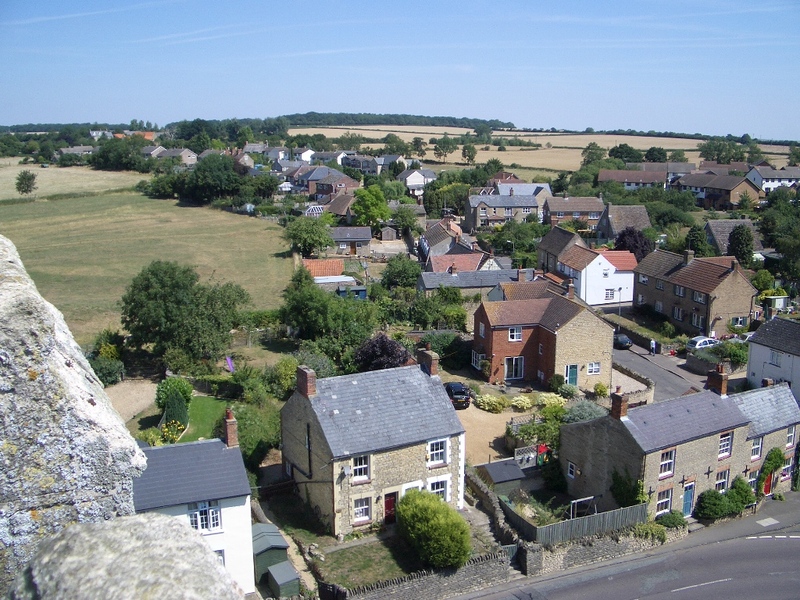 Castle Road viewed from the Church Tower, 24th July 2006 – photo NBS. Also visible on the right hand side of Castle Road, and almost in the centre of the above two views, is what is now No 18 extending at right-angles to the road. 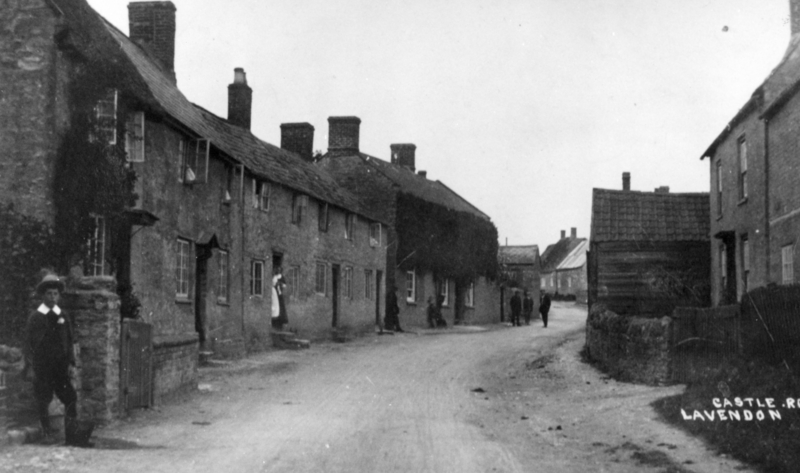 In the earlier view, this is the large building, four cottages in fact, with a thatched roof. It can be seen that the right hand end of the latter thatch is in the process of being removed ahead of full building demolition work, apart from the gable end which adjoins the road and still survives today. This gable end formed part of a new cottage that has twice been extended to form the present day house. On the opposite side of the road was a deep well originally used for local drinking water. Further up the road and on the same side as No 18, is the modern day No 26 clearly visible in the vintage view above. This building was the old village workhouse in days gone by, but as the modern view shows, it was later much reduced in size with the lower ‘half’, complete with corrugated iron roof, removed. Castle Road was once known as Workhouse Lane, as mentioned in the Enclosure Award of September 1802. 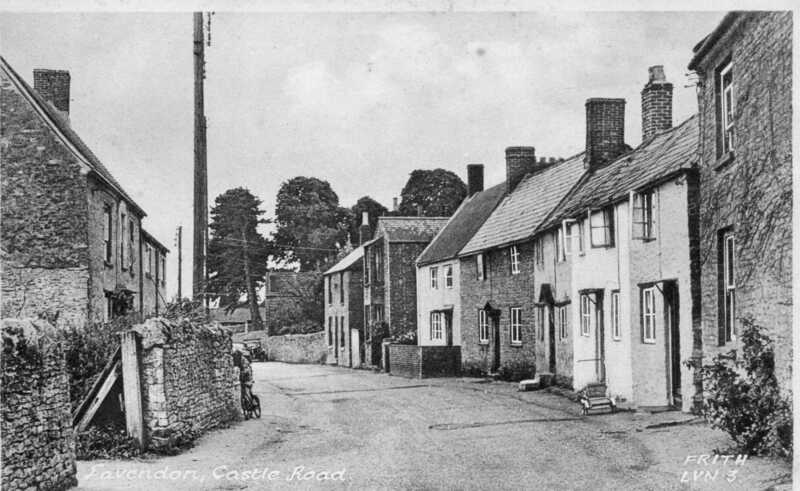 View down Castle Road to the former Workhouse, No 26 Castle Road – photo courtesy of Rod Moore. The former Work House at No 26 Castle Road – photo courtesy of Rod Moore. 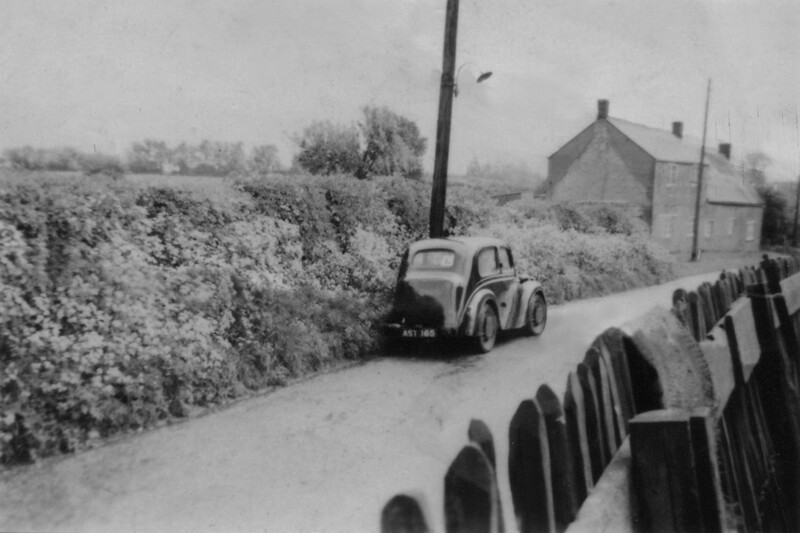 The Hunt in Castle Road – photo by Maurice Kitchener. 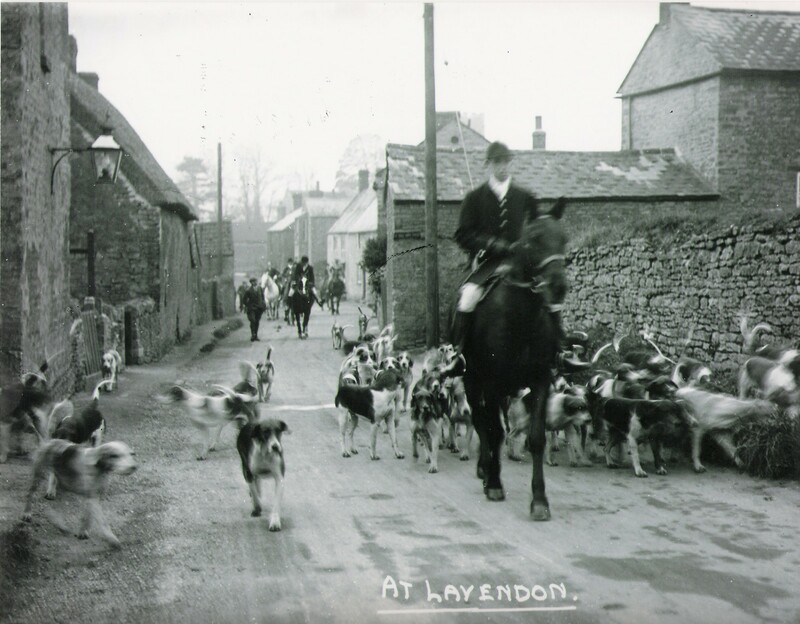 The horse rider leading the hounds is believed to be the late Mr Hartigan who lived at the Grange, Lavendon. The hunt used to be a popular sight in and around the village. Mr Hartigan is buried in the village cemetery. Also visible on the far left of this view is the gable end of No 18 Castle Road with its ornate lamp. On the opposite side of the road, where the hounds are exploring, there used to be one of the many village wells. It was a deep well that was filled in during the 1960s. 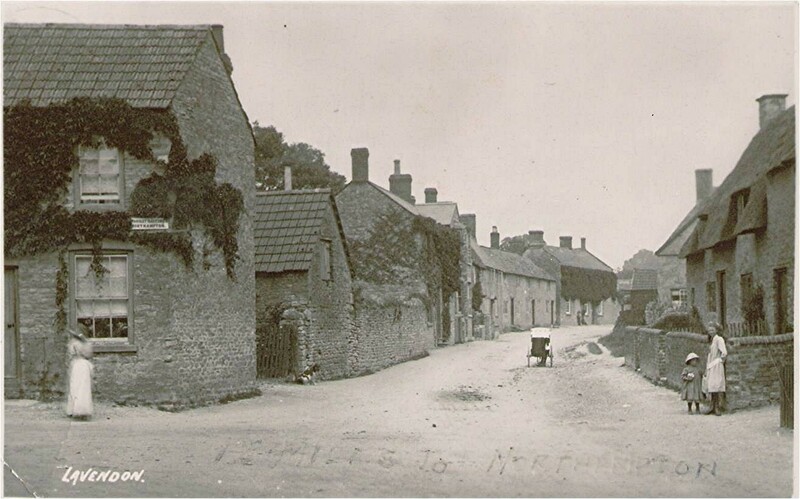 The cottage below No 18 on the left hand side was demolished and replaced by the present day brick house built circa 1963 by the late Frank Lay for his own use. 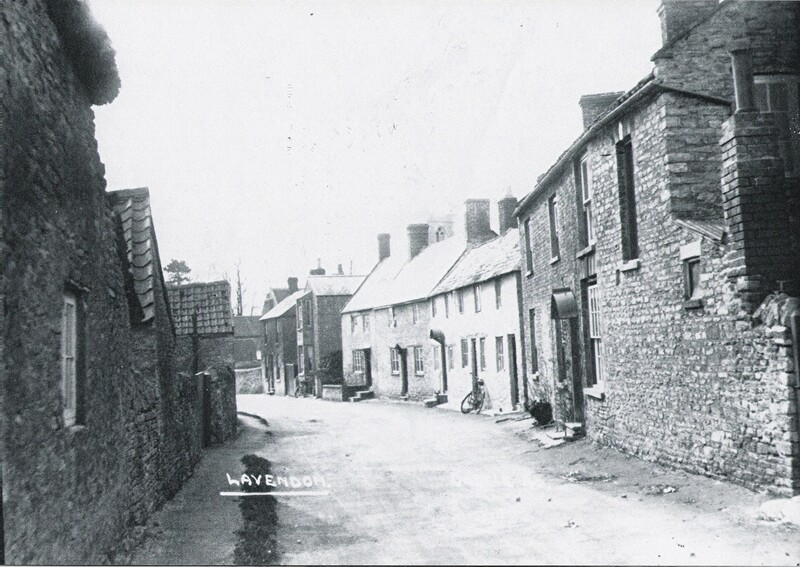 The cottage on the left was demolished and replaced by the present day brick-built house that now flanks the junction with Joiners Way. 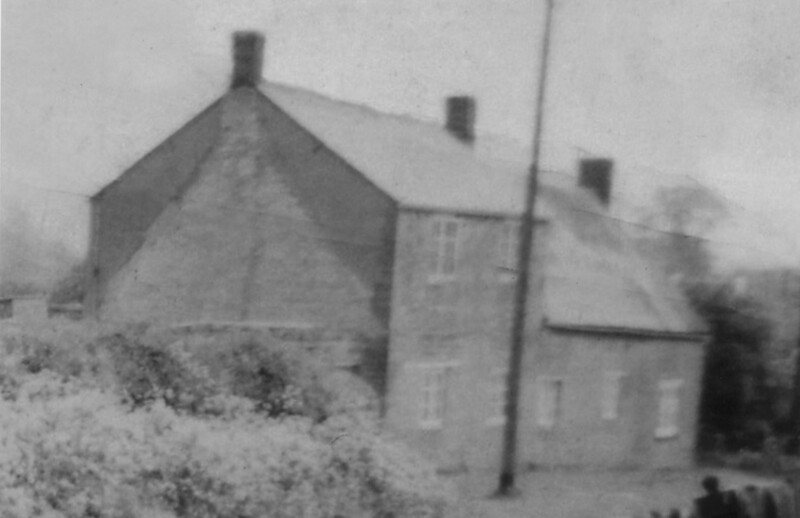 The cottage on the right that used to be known as ‘Greenways’ was also modified, including the removal of the outhouse and chimney visible here; it is now known as ‘The Old Granary’ which sits opposite the entrance to Joiners Way, a development built in the 1960s. Below this cottage on the right are some terraced cottages that were much modified to become what is now known as Bucken House. On the left is an opening to the former smallholdings that existed prior to the construction of the Joiners Way development, the entrance to which is now effectively through the gateway shown here. The terraced cottages mentioned in the previous view above are shown more clearly here on the right. The present day ‘Old School House’ is also visible, furthest on the right. 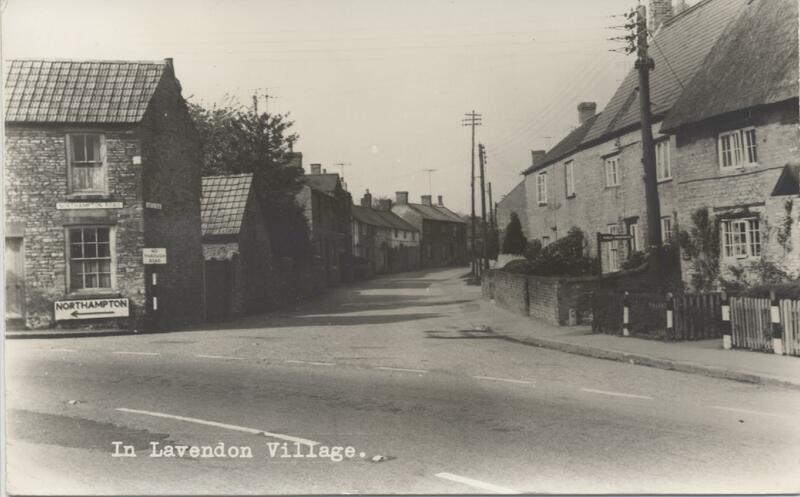 It was formerly owned by the local authority and in that connection was occupied at one time by a former head teacher of Lavendon School, Mr Britnell, who later lived in Olney Road and retired in April 1975. This photo is believed to have been taken in the 1950s.